Child Size Small: (10" wide x 11" length) $19 Child Size Medium: (15" wide x 16" length) $26 Adult Size Large: (22" wide x 24" length) $33 Adult Size XLarge: (24" wide x 38" length) $46 ~ the feather wings bend and adjust to fit comfortably ~ Your flower girl, so young and innocent, will set the romantic mood of your wedding ceremony wearing these precious white feather angel wings. Feather wings for the flower girl are currently extremely popular in Europe, and more and more brides in the US are adding this ethereal accessory. The feather wings stay on the flower girls back with adjustable thin elastic straps attached to the back side of the wings. The back side of the wings is just as pretty as the front! 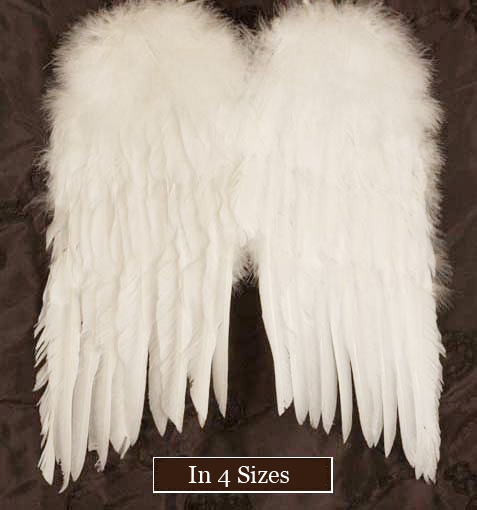 These feather wings are stunning and available in 3 sizes so we will have the perfect size for your flower girls or bridesmaids. Not suitable for children under 3 years of age.